In our last post, we began our study of the Day of the Lord using the darkening of the sun and moon as a 'time marker' to help guide us to WHEN this day will be in relation to the Tribulation, the Battle of Armageddon, etc. We saw that the Lord Jesus, Joel, and John refer to this celestial sign (the sun and moon being darkened) in relationship to other end-time events. This sign is AFTER the gathering of armies to Armageddon (Joel 3:14-15), AFTER the revelation of the man of sin (Matt. 24:15, 29), AFTER the Tribulation (Matt. 24:29), AFTER the opening of the sixth seal, but BEFORE the day of the LORD! The Scriptures are quite clear - the day of the Lord is AFTER the Tribulation. And, therefore, it does not include the Tribulation (as is commonly taught by those who believe in a pre-Tribulation Rapture). Since the Antichrist will be worshiped as God during the last half of the Tribulation, the day of the Lord and the Tribulation cannot overlap. Three times the phrase “the day of the LORD cometh” is used in the Old Testament (Isa. 13:9, Joel 2:1, Zech. 14:1). In each case, the text begins immediately to describe the battle of Armageddon. In all three cases, the arrival (“cometh”) of the day of the Lord brings the battle of Armageddon. Twice in the New Testament, it is said that the day of the Lord “cometh” as a thief in the night (I Thess. 5:2 and II Peter 3:10). Both times, the immediate destruction of the wicked occurs. 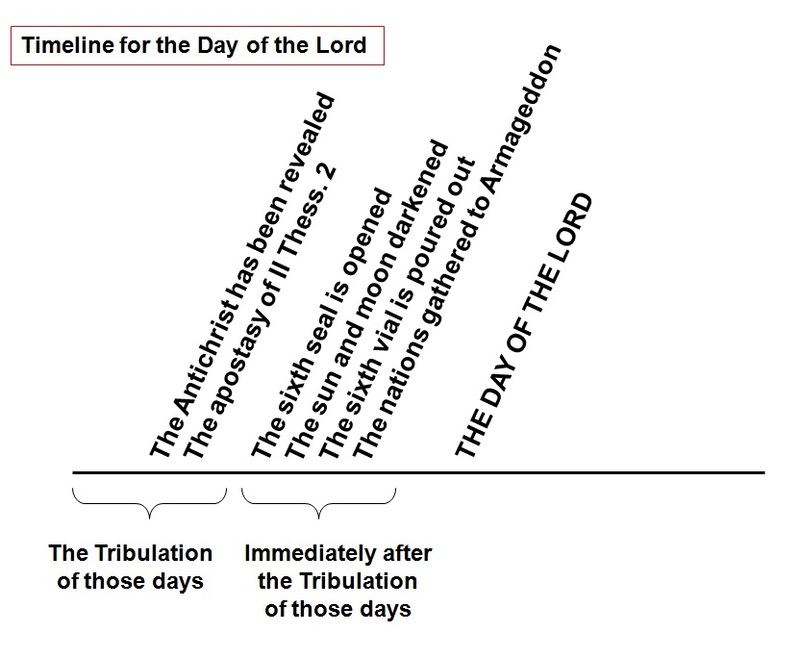 If the day of the Lord brings the battle of Armageddon/the destruction of the wicked, and this destruction comes AFTER the Tribulation, then the day of the Lord also comes AFTER the Tribulation. As already mentioned, Joel 3:9-17 describes the gathering of the armies of the world around Jerusalem in preparation for the battle of Armageddon. After the armies are gathered, but before the cosmic signs, Joel wrote that the coming of the day of the Lord is “near” (Joel 3:14). The Hebrew word for “near” means at hand, or next (in sequence). Elijah is one of the two witnesses of Rev. 11. He and Moses prophecy for a period of 3 1/2 years (Rev. 3:11, they prophesy for 1,260 days ÷ 360 days per prophetic year = 3 1/2 years). The day of the LORD cannot begin until after the two witnesses arrive on the scene. Not to mention, since their 3 1/2 years run roughly parallel to the 3 1/2 years of the Antichrist's reign, then the day of the Lord cannot begin until after the Antichrist's reign begins. the Rapture is also after the Tribulation.